Esther Idassi was born in Tanzania, East Africa. She is married with 3 children. She has more than 5 years working experience in refugee outreach. 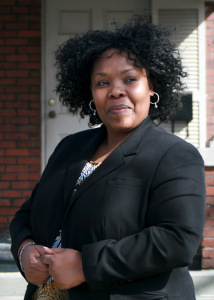 Esther is the founder/CEO of Elimu Empowerment Services (EES) an organization that serves refugees and immigrant people in the Triad area of North Carolina. Her organization, EES, Collaborates with the Guilford County School System providing interpretation and translation services for Swahili speaking parents and students. Esther overseas Elimu Learning Center (ELC) an after school program for refugee and immigrant students provided through EES. Prior to founding EES Esther worked as a volunteer refugee community liaison for the City of Nashville, TN where she co-founded a Tanzania Swahili service that gave refugees in the area a place to worship.